Mercie J is an outstanding local business that we are proud to have worked with for a number of years. At Spotlight Signs, we aim to be stewards of our customers brands. That entails becoming intimately acquainted with these brands and expressing them in effective and faithful ways through signage of all kinds. We love to form trusting and lasting relationships with our customers. Our longtime clients know that with us, their brand is in safe hands. We protect and proliferate brands through vehicle graphics, wall murals, exterior signs, and much more in Mesa, Scottsdale, Gilbert, and Chandler, AZ. Mercie J has been a loyal customer of Spotlight Signs and likewise, we have been loyal to them. 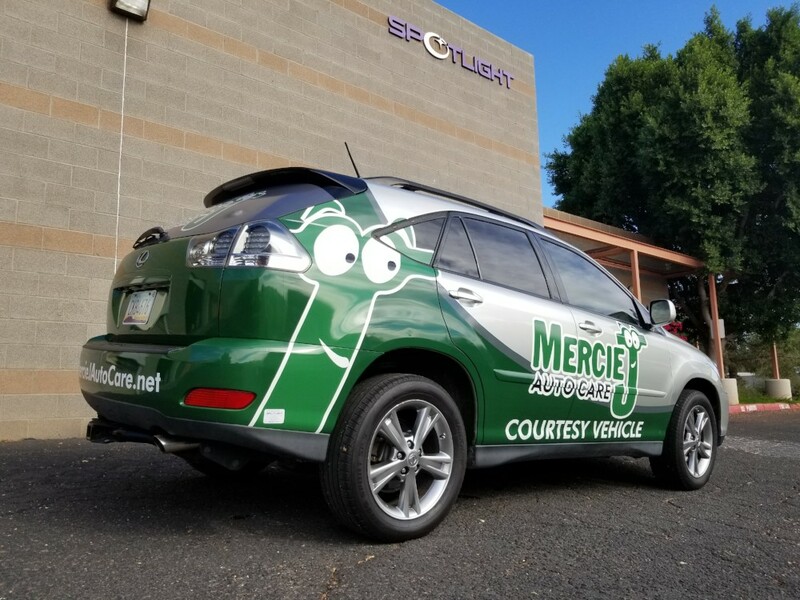 Despite the fact that their facility is a considerable distance from our shop, every employee at Spotlight Signs takes their vehicles to Mercie J for regular maintenance. Mercie J offers exceptional, cheerful customer service and reliability - essential traits for an auto repair shop. Just as our vehicles are precious and valuable to us, a company’s brand is incredibly valuable to them. We feel that we can trust Mercie J with our vehicles and they feel the same way about us with their brand. Over the past few years, we have completed a number of signage projects for Mercie J. Part of what makes the long distance between our locations easier to manage for vehicle maintenance is the company’s pick up service. Just drive your vehicle to them and they will come get you once it is ready. We recently did a great-looking partial wrap on their pickup vehicle to give it a boost in branding power. Now, Mercie J customers will make no mistake in identifying their ride as pulls up to bring them back to their vehicle. In addition to their pickup vehicle, we also mounted graphics to an old-style vehicle that the shop uses as a creative and eye-catching alternative to a monument sign. Monument signs are great for attracting passerby in vehicles, but the fact is that the permitting restrictions of the city may be at times prohibitive. In this case, sometimes a creative solution is in order. Mercie J’s new ‘monument sign’ is a fantastic testament to their brand and is super appealing and interesting to potential customers driving by. Additionally, we put up a great looking acrylic sign that features a beautiful picture of the Superstition Mountains. This high resolution print was adhered to an acrylic panel and mounted using nice silver standoffs for a very classy end-product that boosted the appeal of their lobby - the room in which customers make their first impression of the brand. We would recommend Mercie J to anyone in the Valley who is looking for a trustworthy auto repair shop. Mercie J is a fantastic local company that we are proud to say trust us with the job of promoting and maintaining their hard-earned brand that is synonymous with good cheer and trustworthiness.